Port of Coos Bay is located on the Oregon coast. It is the largest deep-draft coastal harbor between San Francisco Bay and Puget Sound, and is Oregon's second busiest maritime commerce center after the Port of Portland. The port was the site of a proposed coal export terminal that was abandoned after public pressure. 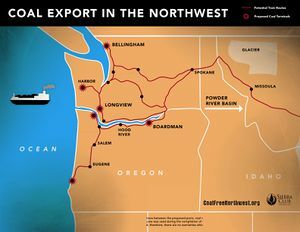 In October 2011 the Port of Coos Bay signed an exclusive negotiating agreement with an unnamed company interested in shipping coal from Coos Bay, Oregon. In April 2013, the Port of Coos Bay announced that it had ended its agreement with Metro Ports of California. Earlier, two other participants in the deal -- Mitsui and Korean Electric Power Corporation -- ended their participation. According to activists, the reported developments had reduced but not eliminated the likelihood of coal exports from the port. According to the group Coos Waterkeeper, the port may still pursue coal export, but expensive rail improvements needed to accommodate coal trains make the prospects "highly unlikely." The port was damaged on March 11, 2011 by a tsunami caused by the 2011 Tōhoku earthquake and tsunami off the coast of Japan. ↑ Scott Learn, "Port of Coos Bay coal-export proposal ends after 18 months of work," The Oregonian, April 01, 2013. ↑ Jung, Helen; Jeff Manning (March 12, 2011). "Waves bring destruction to Oregon's south coast", The Oregonian. Wikipedia also has an article on Port of Coos Bay. This article may use content from the Wikipedia article under the terms of the GFDL. This page was last edited on 30 May 2015, at 00:13.